1. Culture requires conscious effort. Before even considering becoming a great company, it is essential to ensure that you have the structure of a good company; this includes things such as a mission statement, vision statement, value statement and a customer service focus. 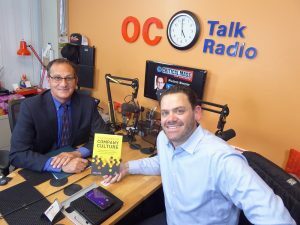 If you don’t have these things, you are behind the curve, Chris Dyer explained on the show, adding that these elements help give your company direction, and allow for a culture in which employees and leaders alike have a comprehensive understanding of where the company is at. Every company has a culture no matter what, so work to build an intentional, engaged culture. Chris added that culture can be seen in how employees operate when the boss is not watching, and that sadly, most employees in the workforce are disengaged, which is likely a result of unintentional company culture. 2. There is a difference between errors and mistakes. While errors are simply things that are done incorrectly, mistakes are a result of trying and failing, and should not be discredited. When a company values openness in its culture, the company and those within it can go back, share what happened/went wrong, and strategize how to be successful in similar endeavours moving forward, which breeds innovation. 3. Listen and be heard. It is not only essential to ensure that you are understanding your target audience, but that you are truly resonating with them. Two way communication matters, and also ties into innovation. Listen to the market and what they say they want, so you can learn and understand the best path forward. Also, it is important to consider how, when and where you approach people. Ensure that their needs are met first and foremost, because if people are disengaged, you will not be able to communicate with them effectively.